This house was built at the end of a cul-de-sac not far from the Greens Farms Metro North train station and Burying Hill Beach. WESTPORT — Tiffany & Company’s iconic blue boxes with white satin ribbons are almost as sought after as the jewelry, china, crystal, and other specialty items that are found inside them. A check of the eBay website shows there are almost 1,000 of them currently up for auction, not one of them large enough for one particular gift worthy of a Tiffany’s designation — the white cedar shingle and stone colonial house at 8 Tiffany Lane. 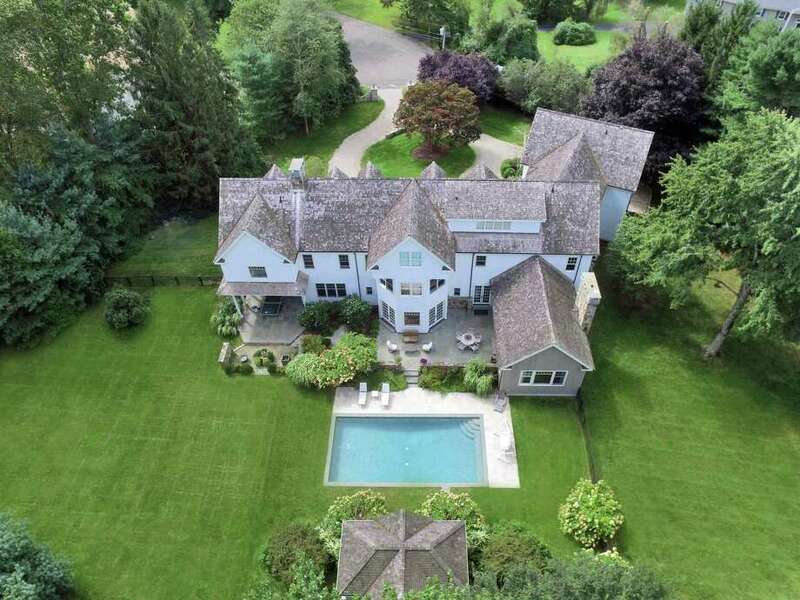 This Hamptons’ style residence sits on a 1.85-acre level property at the end of a cul-de-sac in the Greens Farms section of town, the location providing it with a perfect blend of privacy and convenience. It is positioned between downtown Westport and Southport Village in neighboring Fairfield and the house is within easy walking distance of the Greens Farms Metro-North train station and Burying Hill Beach. As with the most beautiful diamond that Tiffany’s would offer in a ring or pendant, this house is without blemish. It features exquisite custom paneling and extensive millwork throughout its 14 rooms. A wealth of amenities are contained within its living space of just under 10,000 square feet. Stately stone pillars topped with lanterns mark the entrance to the gravel circular driveway lined with Belgium block. A bluestone path leads to the covered front entrance, the door opening into the two-story reception hall, from which there is access to elegant, generously proportioned, sun-filled rooms. Throughout the house there is custom paneling, extensive millwork, tall ceilings, and attention to every detail beginning in the reception hall where the hardwood flooring is arranged in a herringbone pattern that continues into the banquet-size formal dining room and the gallery. This house was built in 2005 with every modern amenity ideal for the contemporary lifestyle, whether living day-to-day or entertaining an intimate gathering or on a grand scale. Entertaining is augmented by the sizable wine cellar, wet bar in the formal living room, cavernous gourmet kitchen, and outside the sizable bluestone open and covered patios, the Gunite heated in-ground swimming pool with a limestone surround, the pool house — which features a fireplace and half bath — and resplendent, serene grounds adorned with a perennial garden, fountain and specimen trees. The living room has a fireplace and a door to the covered patio. Its wet bar has a Vinotemp wine refrigerator, granite counter, and cabinets. The dining room features a custom coffered ceiling and two sets of French doors to the patio and rear, fully fenced yard. The cherry-paneled library has a coffered ceiling, fireplace, decorative leaded glass windows, and built-in bookshelves. The oversized family room has a vaulted and trestle beamed ceiling, a floor-to-ceiling natural fieldstone fireplace, custom treated walls, and French doors to the patio. This room adjoins the kitchen, butler’s pantry, and breakfast room. In the butler’s pantry there are granite Ogee-edged countertops, and glass-front cabinetry. Features in the newly renovated kitchen include a center island/breakfast bar, custom cabinetry, Carrara Bella marble countertops, desk area, and high-end appliances including two Bosch dishwashers, Subzero Refrigerator, two refrigerator drawers, Bosch double ovens, and a warming drawer. Above the Wolf six-burner range there is a pot-filler. As in the dining room, the kitchen and breakfast room also have a coffered ceiling. Off the kitchen is a large mudroom with slate flooring, custom built-ins, and access to the attached three-car garage. This main floor contains one formal and one informal powder room, and a guest bedroom with a full bath. Upstairs, there are five more bedrooms. The master suite features a fireplace, a deep tray ceiling, two separate bathrooms, two walk-in closets, and dressing rooms. Two additional bedrooms are en suite and the other two share a Jack-and-Jill-style bath. The third floor comprises an oversized play room with built-ins, a half bath, and large cedar closet. In addition to the wine cellar, the fully finished walk-out lower level includes a gym with a mirrored wall, additional play and living area, and plentiful storage space. For more information or to set up an appointment to see the house contact Susan Lieberman and Justine Fink of The Riverside Realty Group; Lieberman at 203-858-9411 or suelieberman@yahoo.com, and Fink at 203-246-1906 or Justine@TheRiversideRealtyGroup.com.